I found an old book about gardening which seemed the right size and removed some of the pages. I glued the rest of the pages together and to the back board, I then cut out a niche. 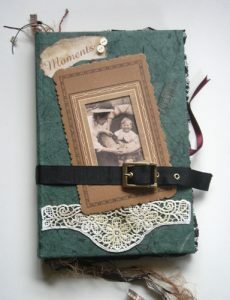 I covered the book with mulberry paper, green on the exterior and cream on the interior. I glued aged lace, a photo in a found frame and a buckle. The buckle serves to keep the book closed and to keep the cards in. 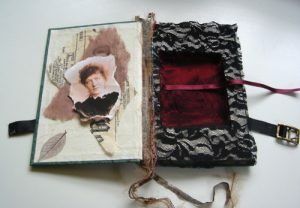 I covered the niche and containing page with black lace fabric leaving it to overlap and covered the niche with burgundy crinkled satin-type fabric. I glued a matching ribbon to one side to make it easier to extract the cards. I glued scraps of tissue newspaper, mulberry paper, a torn photo and a skeleton leaf to the inside front cover. Gorgeous altered book! This is a great way to share genealogy information.